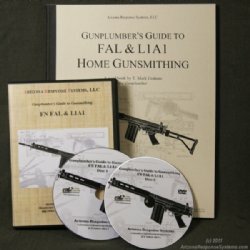 Gunplumber's Guide to Gunsmithing. FN FAL & L1A1 DVD & Workbook. Covers all aspects of building a FAL with your receiver and FAL parts kit. Includes tools, selecting and preparing parts; barreling and timing; adjusting headspace; tuning gas system for optimal performance; customizing; complete disassembly & reassembly, function testing and troubleshooting. Covers Inch, Metric, Israeli and Indian models. 2 Volume digitally produced and edited high-density DVD Discs (5 hours). Workbook compliments DVD with technical specifications, home-made tool drawings, vendor listings, schematics, and much more. 2011 revision = 190+ pages.